ATLANTIC CITY, N.J., Nov. 14, 2018 /Prexly/ — Resorts Casino Hotel, the first casino hotel in New Jersey, today announces that construction is near completion on the DraftKings Sportsbook at Resorts, slated to open by late November 2018, pending approval from the Division of Gaming Enforcement. In partnership with DraftKings, the global sports technology and entertainment company and New Jersey's leading online sports betting platform, the retail space will feature a best-in-class customer experience for sports fans in the Garden State. 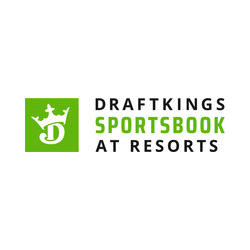 "We are proud to partner with an industry leader in sports betting and open an innovative sports betting experience that only DraftKings Sportsbook at Resorts will offer," said Mark Giannantonio, President and CEO, Resorts Casino Hotel. "Once completed, the new on-property retail space will bring an immersive and entertaining gaming experience for our guests and sports fans alike, ensuring the best sports betting scene in Atlantic City." Marking another major milestone for Atlantic City's first casino hotel, the new DraftKings Sportsbook at Resorts will feature multiple sports and wagering options, such as live, in-game betting with five windows and 12 kiosks, offering multiple opportunities for sports fans to place their bets. Additionally, the space will offer ultra-high-definition video walls, a VIP area, comfortable stadium-style seats with chargers, and a full bar with food and beverage service and bar top electronic slots. "We've been working for months with the team at Resorts to make sure the DraftKings retail sportsbook meets the highest bar for quality and customer experience," said Matt Kalish, Chief Revenue Officer and co-founder of DraftKings. "We are tremendously excited to launch our first physical presence in the state with such a trusted partner, and to service their loyal patrons." DraftKings is a global sports technology and entertainment company that believes life is more fun with skin in the game. Its mission is to bring fans closer to the games they love via a unique combination of daily fantasy sports, sports betting and media platforms that, combined, deliver "The Game Inside The Game." Founded in 2012 by Matt Kalish, Paul Liberman and Jason Robins, DraftKings is headquartered in Boston, MA, and offers daily fantasy sports contests across 11 professional sports in 8 countries including the U.S., Canada, U.K and Australia. Operating pursuant to state regulations in New Jersey, DraftKings Sportsbook allows players in the state to engage in betting for major U.S. and international sports. The resort that brought gaming to Atlantic City in 1978, Resorts Casino Hotel, a Mohegan Gaming & Entertainment Property, is at the top of its game today, offering world-class casino action in a relaxed environment that keeps the focus on fun. Resorts Casino Hotel made history as the first American casino outside of Nevada and recently celebrated a major milestone – their 40th anniversary in May 2018. Winner of 21 Casino Player Magazine 2018 "Best of Gaming Awards," Resorts Casino Hotel has undergone $100 million in renovations, including the all new state-of-the-art Resorts Conference Center, a large $25 million room renovation project and the $35 million Jimmy Buffett's Margaritaville themed entertainment complex with the only beach bar, Landshark Bar & Grill, on the Atlantic City sand open – year-round. Mohegan Gaming & Entertainment assumed management of Resorts Casino Hotel in 2012, a move that has set the stage for its return as the most exciting gaming destination in Atlantic City. Boasting a prime location spanning 11 acres at the northern end of the famed Atlantic City Boardwalk, the resort features 942 guest rooms and suites in two hotel towers, an 80,000-square-foot casino, two theaters, 10 restaurants, a food court featuring six eateries, two VIP slot and table player lounges, a casino bar, indoor-outdoor swimming pool, health club and spa, salon, and retail shops. Its 64,000 square feet of technologically advanced meeting space includes 24 meeting and function rooms, most featuring natural light and ocean views, and a 13,000-square-foot ballroom. For more information, visit our website or call 1.800.334.6378. Connect with us on Facebook, follow us on Twitter or Instagram and view us on YouTube.